A weekly dental inspection and care can be followed by the inspection of your cat’s ears. 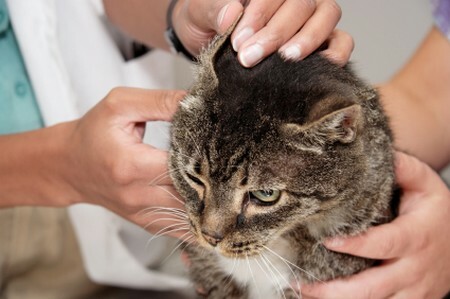 Generally speaking, a healthy cat does not mind his owner holding the ear pinna and examining the cleanliness of the outer ear region. There are many ear-cleaning items on the market, such as ear-wipes, which are specially treated cloths. You can make up your own ear-cleaning kit by purchasing ear-drops from your veterinary surgeon. Baby oil is also suitable for this purpose. A couple of drops sprinkled on to a cotton-wool ball is sufficient. Make sure you dampen the cotton-wool first so as to prevent any loose strands of cotton-wool working their way into the ear canal. Cotton buds are not ideal for this purpose, as you could cause pain or injury if you probe too deeply into the ear canal. The excess ear wax you will be removing should be buff-coloured. Any wax that is dark in colour could be indicative of ear mite infestation. If you detect any inflammation or foul-smelling discharge, seek advice from your vet. Equipment: Claw-clippers, antiseptic scrub for washing your hands, ear-wipes (or ear-drops or baby oil) cotton-wool balls, rubbish bag and treats. Training objective: To persuade your cat to sit still and allow you to clean his ears. Collect all the items you need for this task before washing your hands and picking up your cat. Make sure his claws have been recently clipped. Sit your cat on your knee, and speak to him quietly as you touch his ear. Place the impregnated cloth over your index finger, or hold the cotton-wool ball between your index finger and thumb, and gently hold your cat’s ear with your other hand. Using the cloth or cotton-wool ball, gently wipe over the part of the outer ear that is visible. Praise your cat at the end of the session and give him his reward. Clear away the soiled material and wash your hands.